Hey moms--- let's talk shoelaces! Do you ever feel like you spend half your days with the children reminding them to tie their shoes... or just tying the shoes for them? I know I do! Trying shoes was difficult for my son to learn. Try as he might, he just struggled with it for a long time. For many years, we just used velcro or slip on shoes, but as he got a little bit older, those became harder to find. Thankfully, he did in time figure it out, but even now at 10 years old he at time struggles to get them tied well... or in a timely fashion. We recently discovered a great product that I am excited to share with all of you today- Hickies. 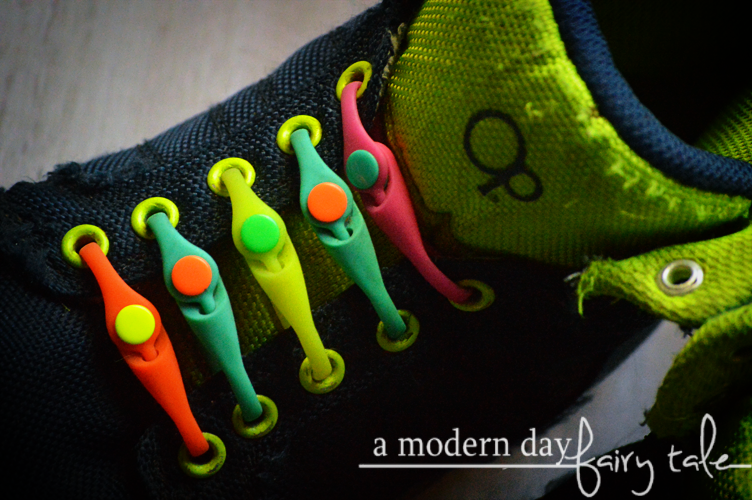 They are elastic shoe 'laces' that turn any pair of sneakers into convenient, comfortable, and stylish slip-ons. We were given the chance to experience these for ourselves and they truly live up to their motto--- Never tie, never worry. We added these to a pair of tennis shoes with broken laces, and not only did that add some fun color to his style, he hasn't had to worry about tripping over laces or stopping mid play once! They were very easy to add- in fact, he took one shoe himself! And they're not just great for kids, but for adults too. Sure, we may be capable of tying our shoes, but I'd still take a great slip on ANY day! Want to try them for yourself? You can take 25% off with code USFAM now thru Oct 31st! http://usfamilyguide.com/coupon.php?bid=13107&dealid=3026 . These great shoelace alternatives would be a great fun, yet practical stocking stuffer this holiday season... and it's a gift to yourself too!